Seaway Manufacturing of Erie, PA, manufacturer of residential replacement windows, patio doors and sunrooms, presents “Look Into Your Windows,” an educational series designed to answer the most frequent questions about choosing replacement windows for your home. 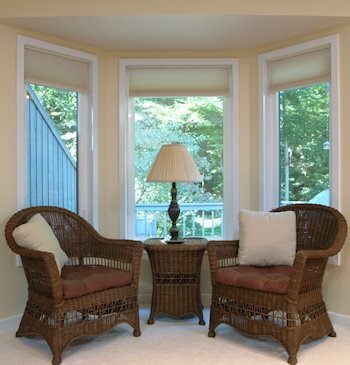 In this installment, a look at casement and awning windows. As noted in a previous post, double hung windows are far and away the most popular replacement window style. But double hungs are not the only option. Here’s a look at why you might want to consider casement or awning windows for all or part of your home. First of all, what exactly are casement and awning windows? Casements have a single sash that opens outwards, similar to a door, when a handle is operated. Awning windows follow the same concept but are hinged at the top, not on the side, resembling an awning when open (hence the name!). From here forward we’ll keep it simple and refer to casements, but know that awning windows are similar in every other way. Many contemporary-style homes feature casement windows. Without the ‘crossbar’ (actually called a meeting rail) of a double-hung window, a casement presents a larger glass area and a sleeker appearance. So if your home already has casements you’ll probably want to stick with that style when you replace them. But there are other reasons to consider incorporating casements into all or part of your home, and the main one is air flow. With double-hung windows, at least half of the window opening is always blocked by the sashes, but a casement’s sash swings out of the way almost completely. If you love the feel of fresh air coming through your home, there’s no better choice. You’ll often find casements on either side of a picture window for this very reason. Older-style casements had a couple of big drawbacks: most had multiple latches to secure the window when closed, and these were difficult to operate and/or hard to reach on taller units. And the handle to open and close the window was unwieldy, sticking out and often interfering with curtains or blinds. Many modern casements feature multi-point locking systems, where a single latch locks the window tightly from top to bottom. And the operating handle in better casement windows folds inward for a sleek, flush appearance that won’t get in the way of your window treatments. Is there a downside to choosing casement windows? Well, they don’t tilt inward as double hung windows do, so cleaning the outside glass surfaces can be a little trickier. In many cases, though, both sides of the sash are easily reached when the window is fully open. This is largely dependent upon size and location of the casement. Although many homeowners choose casement windows for the uninterrupted glass area, casements can have grids in all the same varieties as other windows. At Seaway, we have designed a special grid to make the casement emulate a double hung, thus creating a consistent appearance for homes with primarily double hung windows who want to take advantage of the benefits of casements while maintaining the look of the rest of the home. And you’ll find all the same energy-saving options in glass packages as well … Choosing casement windows does not mean compromising energy efficiency. In fact, they are frequently the best style to choose to minimize air infiltration. Questions about casement windows or other replacement windows? Contact Seaway Manufacturing, or click here and enter your ZIP code to find a Seaway dealer in your area.